Do you own a small business? Are you growing? Is your small business taking over your dining room? Do you pay for office space merely to store items? 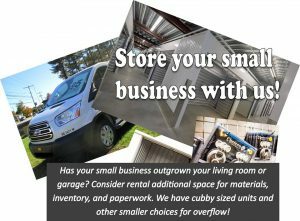 Leasing a large office space to fit all your miscellaneous items for your small business may be costing you more than you think…consider leasing a smaller space and renting self-storage to save on overhead costs. We offer 10% off for 6 months prepayment. We have closet sized units to store seasonal items, paperwork, totes, etc. A little more about us: With 21 years of storage experience, we offer self storage that is not only clean, convenient and safe, but also competitively priced! • Think snow? We shovel your door! • Need boxes or packing supplies? We sell that!